I'm delighted to post this today from friend-of-the-blog Jennifer Graber, Professor of Religion at the University of Texas, previously interviewed on the blog here, and author (among other things) of a stunning article on religion, war, and violence, which I blogged about here. Jen was recently at the Oklahoma Historical Society, researching her next book, and sent this dispatch on researching Kiowa history. Parker McKenzie, a Kiowa linguist, lived to be 101 years old. After his death in 1999, McKenzie’s family donated his papers to the Oklahoma Historical Society. 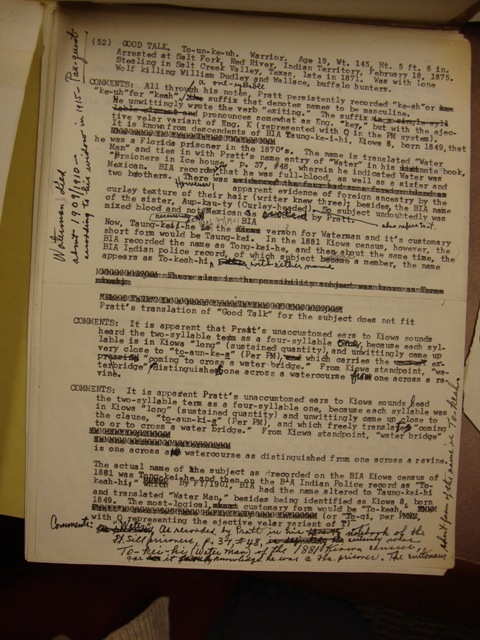 The 34 boxes contain notes from McKenzie’s work to create a Kiowa alphabet and his publications on Kiowa vocabulary. After three days in the archives at the Oklahoma Historical Society, McKenzie’s corrective efforts left me unsettled. Isn’t it inevitable that I will end up as one more in a long line of non-Kiowa historians who McKenzie needs to correct? Won’t he be the ghost, looming over my shoulder, scribbling corrections in my margins? Maybe so. While my experience working through Parker’s papers certainly unnerved me, I have decided to welcome the ghost. By way of McKenzie’s life-long work and his family’s generosity, historians like me have one more way to access alternative accounts of the Kiowa story. I can sort through his notes, often collected on the back of old calendars and tax returns, in which McKenzie carefully recorded his understanding of who is related to whom, of what names meant and how people received them, and of the ways that Kiowas tell their stories that other historians have obscured. I figure that this ghost will exhaust me. Perhaps out of nervousness, but hopefully out of the scholarly pursuit of data, I will seek out every possible source that gets at Kiowa perspectives. I’ll check every name. Every date. Every family connection. I’m sure I’ll get something wrong. But maybe this ghost will prompt me to get at least a few more things right. So, welcome to my book, take a rest on my shoulder, Parker McKenzie!